Rockfon is part of the ROCKWOOL Group and secialise in providing customers with a complete ceiling and wall system. 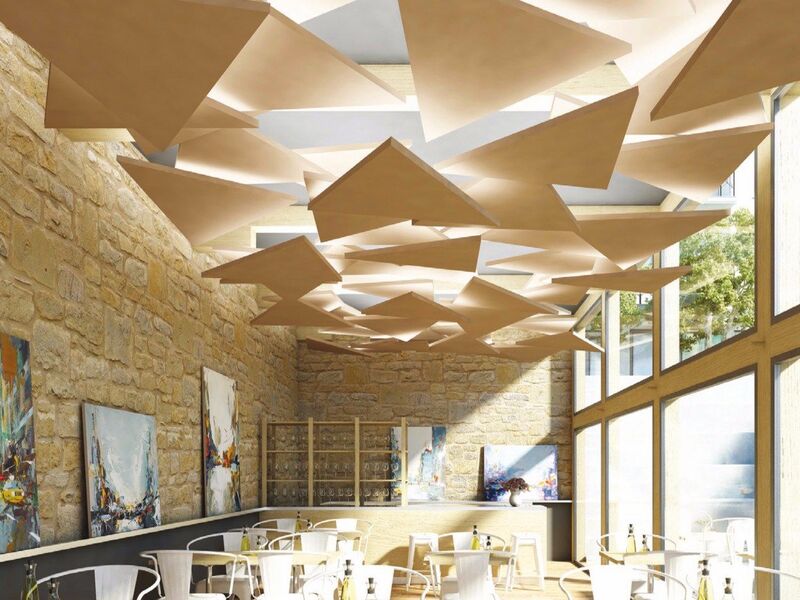 Their sound absorbing ceiling and wall systems are a fast and simple way to create beautiful, comfortable spaces. Rockfon and Vision have collaborated to deliver a completely unique acoustic experience. This collaboration has allowed us to offer a fully customisable acoustic ceiling and wall products. Allowing for design led products to come to fruition to deliver the highest standards to our customers. 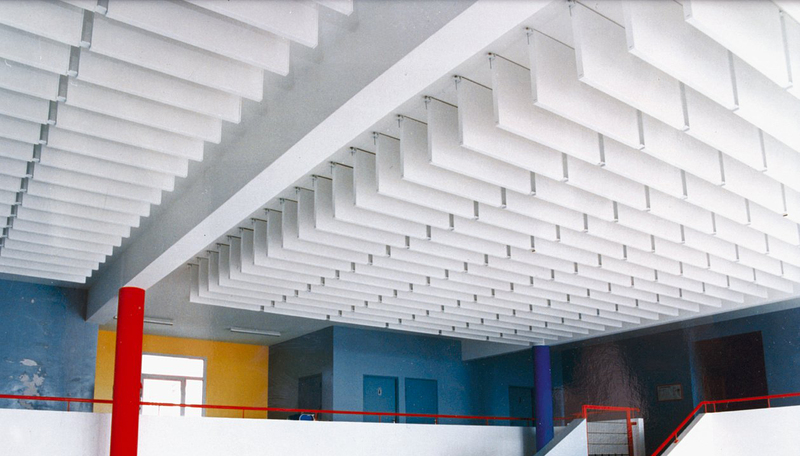 Both the horizontally installed Rockfon® System Eclipse Island™ and the vertically installed Rockfon® Fibral™ Multiflex Baffle are frameless acoustic solutions available in a variety of geometric shapes. The visible side of Rockfon Eclipse features a minimalistic straight painted A-edge and is covered with a smooth, deep matt, super white painted fleece that has anti-static properties, extending product lifetime. It is also available in bespoke colours. The reverse side of the island is covered with a white acoustic fleece. 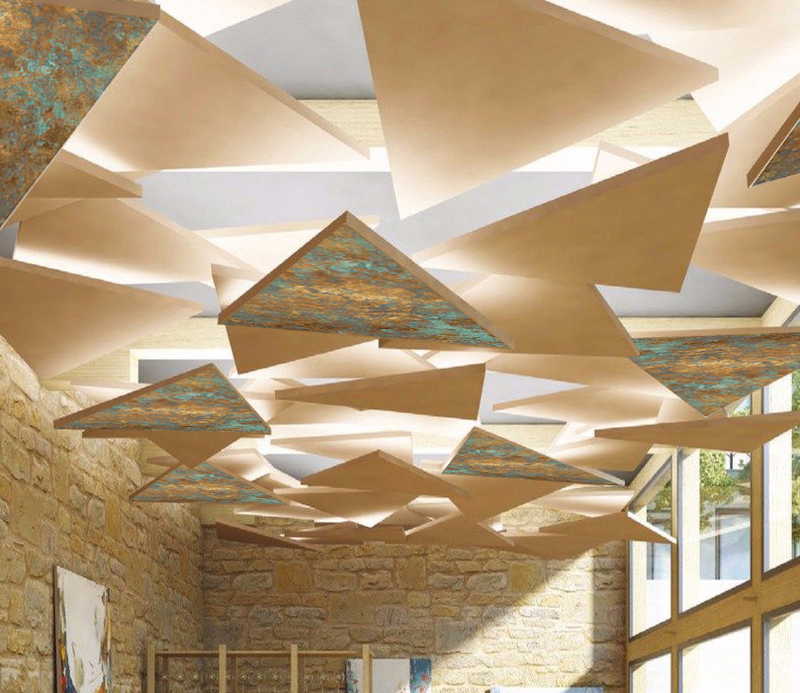 Rockfon Eclipse can be suspended under an existing soffit, T24 grid or gypsum ceiling. Using specifically designed accessories, it can be fixed directly to the soffit itself. The Rockfon Eclipse Rectangle, 2360 x 1160 x 40mm, has two special white aluminum profiles that are integrated to the rear of the island providing extra stability during the installation. 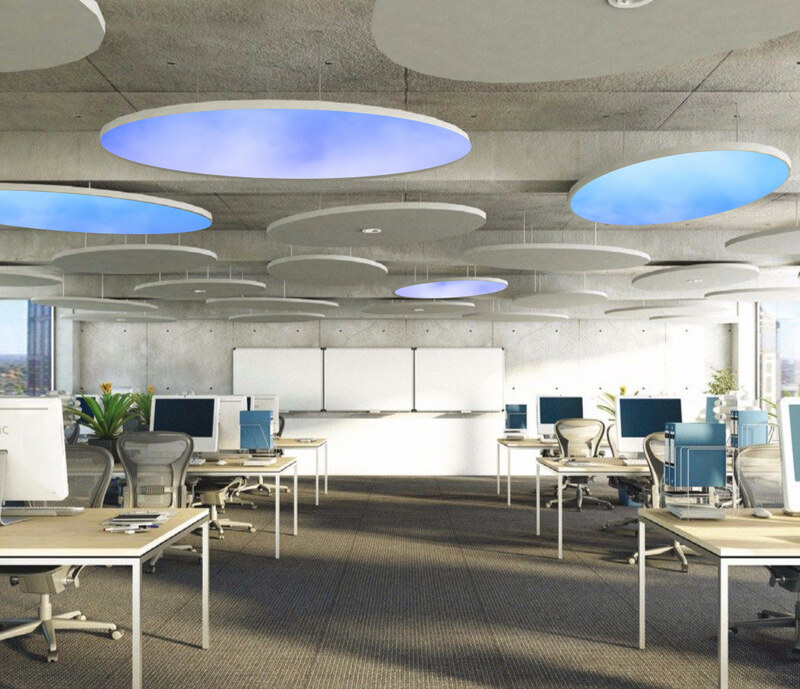 This acoustic system is ideal in rooms and buildings where the use of a traditional suspended ceiling is technically not appropriate (e.g. where the principle of thermal mass is incorporated in the building design) or is aesthetically unappealing. It is a good and flexible solution to make room acoustic improvements in existing buildings. Rockfon System Eclipse Wall is a frameless acoustic solution available in a variety of geometric shapes. The visible side of the Rockfon Eclipse Wall panel features a minimalistic straight painted A-edge and is covered with a smooth, deep matt, super white painted fleece that has anti-static properties, extending its product lifetime. The reverse side of the wall panel is covered with a white acoustic fleece. Rockfon System Eclipse Wall should only be fixed using the specific Rockfon Eclipse Fixing Kits. Two kits are available: a Direct Fixing Kit, creating a gap between the wall and the panel of 15 mm, and a Stepped Fixing Kit, creating a gap of 65 mm. By using a combination of both kits, overlapping wall panels is possible. 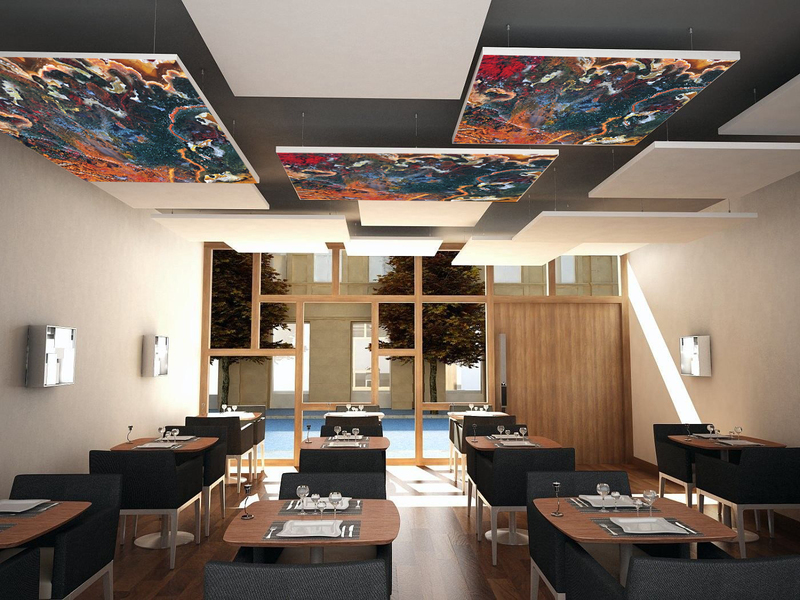 This acoustic system is ideal in rooms and buildings where the use of a traditional suspended ceiling is technically not appropriate (e.g. where the principle of thermal mass is incorporated in the building design) or is aesthetically unappealing. It is an attractive and flexible solution for enhancing the acoustics in many spaces. 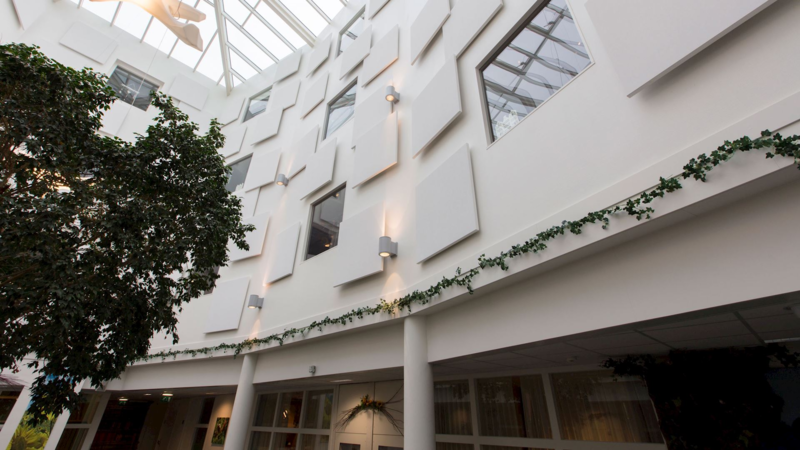 Through countless jobs using Rockfon, Vision have become quite familiar with their entire acoustic offering and are now able to offer full installation and design of their range. Vision can print on Rockfon's entire collection, achieving customer inspired designs. Colours, patterns and pictures can be printed using onto both wall and Ceiling baffles.